In Europe, there are sure signs that underwater mining is the next big market for autonomous underwater vehicles (AUVs), remotely operated vehicles (ROVs) and new “drones” called HROV, DART or TURTLE. Among the indicators is the involvement of mining companies, governments, rich subsea players and the Dutch dredging community. New vehicles are being developed from Hungary to Hawaii, although Portugal, it seems, is at the forefront of new-vessel commercialization. Apart from dredging up gold and diamonds nearshore, underwater mining is about two activities: tapping the leftover mineral deposits in about 3,000 flooded and abandoned European mines and, more pertinently, mining for minerals in the exclusive economic zones, or EEZs, of maritime countries where rare earth elements, or REEs, are known to lie. There’s a quiet desperation surrounding both enterprises, as REEs are the stuff of iPhone screens, military-grade aluminum, hybrid cars, TVs and the newest batteries. Enter the drone. 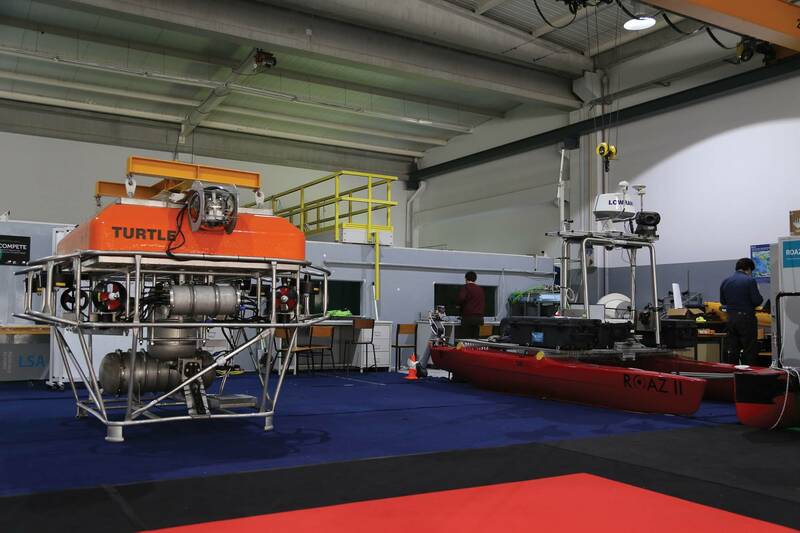 The European Union is marshalling its mechatronic (multidisciplinary, robotic) research communities — its university engineering faculties and applied-science scientists — and its geologists to build a supply chain that can mine underwater. EU-funded projects, of which there are many, have helped launch a new spherical drone called UX-1b to map and monitor the contours of confined sunken mines, and an EU-backed consortium is also about to launch (as are the Norwegians) a mining system comprising a nodule-crunching tracked vehicle, its launch-and-recovery unit and a specialty “drone”. In fact, the future of subsea mining looks set to always be a tracked vehicle with a supporting cast of ROV, AUV and now HROV escorts. The EVA subsea-mining support vessel, a hybrid or HROV, is part of a mining system that consists of a large, 20-tonne mining vehicle and a surface launch-and-recovery barge that might be easily replaced by a vessel with moonpool. 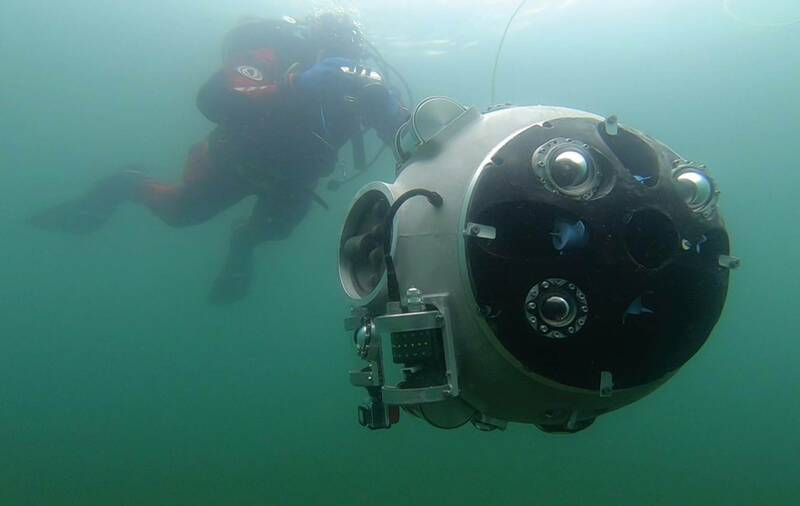 “Eva is used for real-time pit modelling and for assisting the underwater cutting operations providing visual and detailed sonar information from multiple points of view of the cutting, launch and recovery of the miner,” explains Alfredo Martins, senior researcher at INESC TEC’s Centre for Robotics and Autonomous Systems. 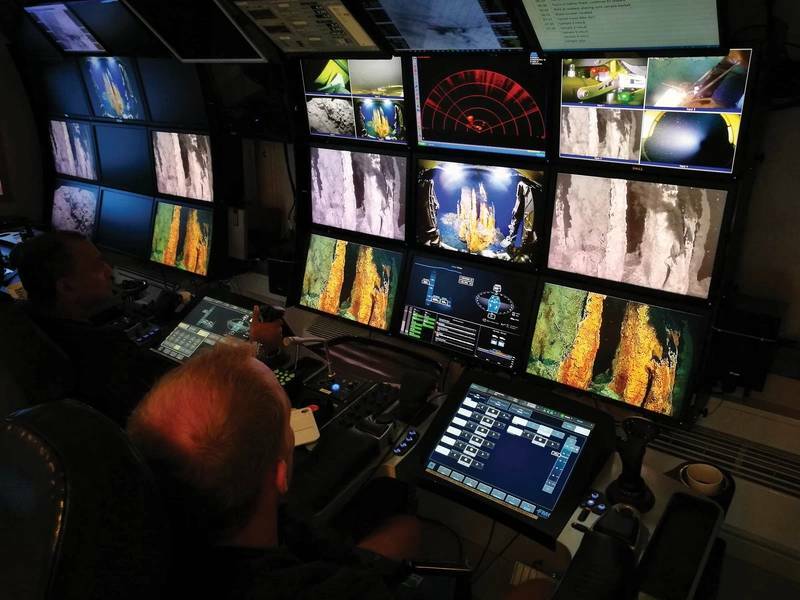 “This information is fed into an integrated virtual environment for the human operators and supervisors,” Martins says, before confirming that EVA can also deploy offshore “either operating in AUV mode or in ROV mode”. The 60-strong community of researchers appears to lead the drones-for-mining pack when it comes to vehicle “awareness”, autonomy, control and commercialization. INESC TEC’s researchers have developed a disproportionate number of robots for ocean industries. 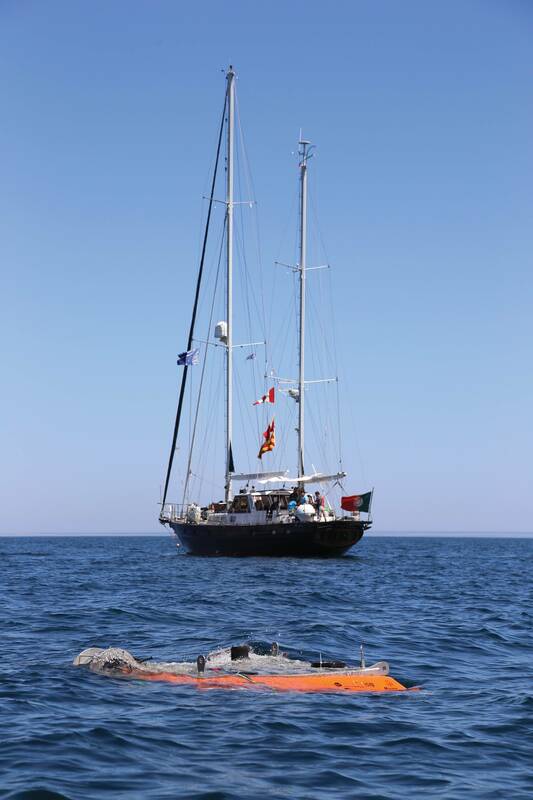 These include the DART deep sea survey AUV and the autonomous deep-sea robotic lander dubbed, TURTLE. 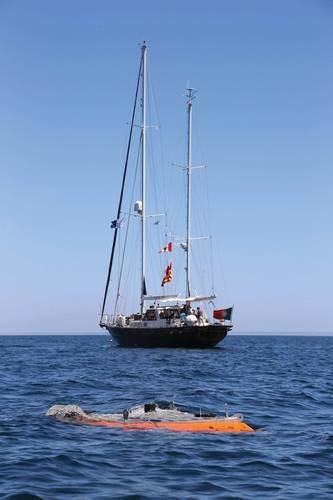 In general, AUVs, ROVs — together, are seen doing sampling survey, mapping, hyperspectral photo work (metals detection), environmental monitoring, risk assessment, cutting-process observation and serving as equipment mules from seabed to surface. The EVA HROV also uses advanced mineralogical sensors, or Laser Induced Breakdown Spectroscopy (LIBS), to analyze the seabed or minerals being lifted. 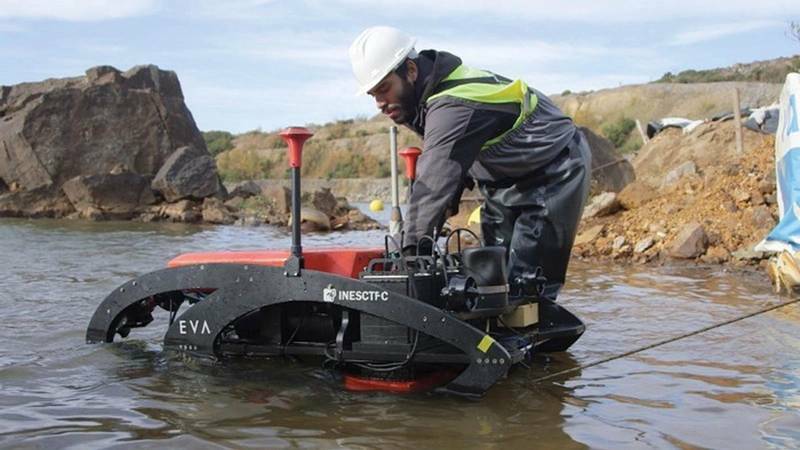 In all, INESC TEC developed the “perception, navigation and awareness systems” for the mining vehicle and EVA robot (together the same EU project). The other AUV developed under the aegis of the EU is the UX-1 (prototype) or UX-1b, a spherical vehicle equipped with lasers to help mining vehicles navigate and mining companies understand the contours of an underwater mine. Impressively, INESC TEC is also a key outfitter for this Europe-wide research success story that involved 17 consortium partners from nine European countries, including robot developers SMD and BMT (UK), DAMEN (the Netherlands) and SANDVIK (Germany). Well-financed, subsea-focused Norwegians centered around the University of Bergen have certainly taken note of these mining equipment successes. In the run-up to and follow-up of the 47th Underwater Mining Conference in Bergen last year — yes, the 47th — organizers noted the achievements and attendance of a Who’s Who of subsea maintenance and survey work. Among them, organizers heralded the news that Swire Seabed had just acquired a HUGIN AUV from Kongsberg Maritime after doing pipeline inspection work for oil company Equinor. In a press release, the Singapore-based outfit said it was now ready to “go beyond current industry needs”. 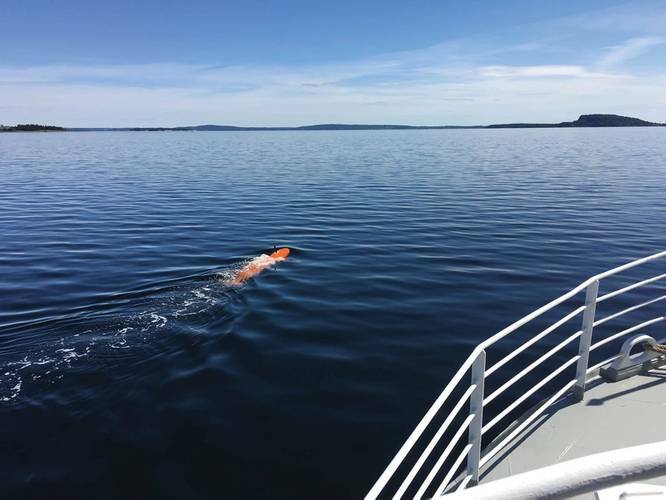 In fact, early in 2018, Swire Seabed had begun the Norwegian government’s first commercial cruise to map marine mineral resources of copper, lead and silver on the Norwegian continental shelf (by AUV survey and ROV rock sampling). “This can become a new market for them (Swire Seabed) and possibly for the entire subsea industry,” a Norwegian taxpayer-funded incubator outfit said on its Web page (fittingly, we went to press, massive deposits of REEs were being found in fabled Norwegian county, Telemark). Swire’s Norwegian advisor for survey and AUV operations was quoted as saying, “our equipment and competency is very well suited to this emerging market”. He said deep-sea mining — seen as poised to take off — mostly requires AUVs for mapping. Meanwhile, at INESC TEC and elsewhere, including the University of Hawaii, underwater mining tools target the whole gamut of mining-support tasks. Some high-capital mining and subsea players have already surged ahead, if mostly in the dredging of coastal zones. Earlier out than Norway, Papua New Guinea, Japan and the Cooke Islands have created rules to govern this nascent industry. Toronto-listed Nautilus Minerals is deeply involved in the Bismarck Sea project, Solwara 1, where the world’s first, large-scale, deep-sea mining project at depths of 1,600 meters targets copper that’s nearly 14 times richer than that found on land. A large new vessel is being built for an undertaking that’ll use risers to lift minerals. Swire Seabed, too, has worked with Ocean Infinity, a Houston-based seabed exploration company which has paired six HUGINs with six unmanned surface vehicles, or AUVs, to survey vast areas of seabed using multi-beam (seismic) bathymetry and echosounders; bottom profilers; HD cameras; conductivity sensors; ocean-floor magnetometers and laser sensors. Importantly, those AUV payloads largely require the REEs subsea mining seeks. Deep sea mining techniques are being polished in the wake of major offshore acreage awards. Deep sea miner, Ocean Minerals, says REEs are “17 chemically similar metals consisting of the 15 elements known as the lanthanides plus yttrium and scandium” and they’re of value due to their “unique magnetic, chemical and luminescent properties” and essential to makers of hybrid vehicles, mobile telephones, computers, etc. That’s why the company, in 2017, secured exclusive rights to 24,000 square kilometers of the Cooke Islands EEZ. The South Pacific nation has had a Seabed Mining Act since 2009, and OML will work with its Seabed Mining Authority to make the most of exploration licenses and permits acquired since 2013. The company says a 2016 multi-year R&D pact between the (Aberdeen Proving Ground) in Maryland and Deep Reach Technology of Houston identified over 180 MM t of REEs and Sc. Not surprisingly, and in light of its recent REE discoveries, Norway has announced it will follow the Cooke Isles example of issuing licenses to qualified subsea mining companies. 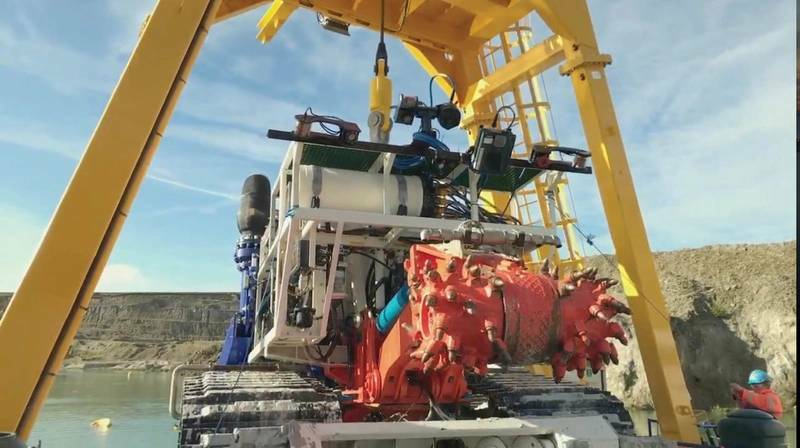 Ocean Minerals’ qualified offshore process involves lowering pipe bound to nodule-harvesters on the seabed. Nodules are collected, screened, separated and concentrated for transfer via lift pipe to a production vessel as seawater slurry. Another pipe adjoining the lift pipe returns seawater back to the ocean. So, deep-sea mining combines the tech and experience of offshore oil and gas (risers, umbilical, surveys and “drones”) with the experience of dredging; nearshore diamond and gold mining and the land-based mining industry. “It is a relatively small industry sector at the moment, but with potential to grow,” says Richard Mills, Kongsberg Maritime’s director of Marine Robotics sales. While its clear that Kongsberg’s payload-rich, torpedo-shaped AUVs will be valuable as pre- and post-exploitation survey vehicles, there might also be a subsea mining role “in association with the excavators” for the company’s uncannily eellike, Eelume ROV. Meanwhile, Swire Seabed and associates Ocean Infinity are understood to have over a dozen HUGIN AUVs in service, and they ran the Norwegian Petroleum Directorate’s minerals cruise. HUGINS doing survey work might always take the lead offshore in the preparatory stage of subsea mining. “We are not always aware of what our customers do with the vehicles,” Mills says. Once the mining begins, it’ll be ROVs and HROVs like the EVA or TURTLE. The latter is INESC TEC anticipating the future costs of seabed mining: the versatile TURTLE robotic lander doesn’t need specialized launch equipment, it relocates autonomously and can come to the surface for maintenance without expensive vessel support. Subsea services group Acteon announced Thursday it has agreed to acquire offshore marine geotechnical and geophysical survey company Benthic.